Scott’s prime lasted for five seasons: 1985 through 1989. During that period, he won 86 games and lost 49, with a 2.93 ERA. He struck out 1,038 batters in 1,192⅓ innings, and his WHIP (walks plus hits per inning pitched) was an outstanding 1.06. He won a career-high 20 games in 1989 and was runner-up for another NL Cy Young Award. That year, though, he hurt his shoulder and began to struggle. Scott pitched his last game in the majors in April 1991, aged just 35. Scott also took part in international baseball competition. He was a member of the United States College All-Star team, led by Paul Molitor, that defeated the Japanese College All-Stars in 1975. In Game Two of the best-of-seven series, Scott pitched the final seven innings in relief of Floyd Bannister, allowing just one run. He got the win when Ken Phelps hit a solo homer in the 13th.10 That October, Scott also pitched for the United States in the Pan American Games. In Mexico City, Team USA’s squad was also loaded with future big leaguers. They went 6-2 and took the silver medal behind Cuba. The 21-year-old was first assigned to Double-A. He pitched well for the Jackson (Mississippi) Mets of the Texas League in 1976 and 1977. His 14 wins and 14 complete games led the league in ’77, earning him promotion to Triple-A near the end of the season. Scott went into the 1977 season as a married man. His wife, Vicki, also grew up in Hawthorne and went to high school with Mike. They had two daughters, Kimberlee and Kelsey. They celebrated their 38th anniversary on February 26, 2015. Indeed, Scott was sent back down to Tidewater in mid-June. After performing well there (8-4, 3.18), he was recalled in September. “I went to Puerto Rico to play winter ball in 1979,” Scott remembered, “but I was only there a couple of weeks. I came home when my daughter was born.”15 Scott also spent the bulk of the 1980 season at Tidewater, cementing his status as a good prospect (13-7, 2.96). Again he was called up when the rosters expanded in September, and he never pitched again in the minors. Scott himself noted, “I really didn’t have any mentors with the Mets.”17 That statement is surprising because in 1982, the team had two excellent pitching instructors in manager George Bamberger and coach Bill Monbouquette. Jesse Orosco, for one, benefited greatly from their tutelage. In his next and final outing of the regular season — again versus the Giants — Scott made a bid to match Johnny Vander Meer’s unique feat: back-to-back no-hitters. The first San Francisco hit did not come until Will Clark led off the seventh with a double. 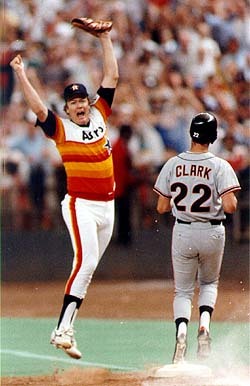 Clark scored, and Scott left trailing 1-0, but the Astros tied it in the ninth and won it in the 10th. In 1987 Scott was an NL All-Star once more. His marquee numbers weren’t as impressive (16-13, 3.23) for a sub-.500 team, but he still struck out nearly a batter an inning. He finished seventh in the Cy Young voting that year. Scott had two other one-hitters in the majors. The first was on April 15, 1987, versus the Los Angeles Dodgers. The spoiler was Mariano Duncan, with a third-inning single. The other came against the Pittsburgh Pirates on May 19, 1989. That time Glenn Wilson singled to lead off the eighth. When Scott won 20 games in 1989, he lost just 10 and posted a 3.10 ERA. He made his third All-Star team (though he did not appear in the game). He received four of the 24 first-place votes for the Cy Young Award. Mark Davis, who had a career year out of the bullpen for the San Diego Padres, got 19; the other went to Orel Hershiser. Thanks to Mike Scott for his help. 1 Charley Feeney, “Umps: Scott Doesn’t Scuff,” Pittsburgh Post-Gazette, October 14, 1986, 32. 2 David A. Goss, “Michael Warren Scott,” Biographical Dictionary of American Sports (David L. Porter, editor) (Westport, Connecticut: Greenwood Publishing, 2000), 1376. 3 Warren L. Scott obituary, greenhillsmortuary.com, November 2, 2013. 4 Ray Kerby, “An Interview with Mike Scott,” astrosdaily,com, February 4, 2002. 5 Cougartown.com (website devoted to happenings in and around Hawthorne and Hawthorne High School), Feedback page 1145. 6 First given in 1981, this award is presented annually to the parents of a major-league baseball player who were actively involved in their sons’ Little League experience. Lance and Robin Van Auken, Play Ball! The Story of Little League Baseball (University Park, Pennsylvania: Pennsylvania State University Press, 2001), 228. 8 “Mike Scott Inducted into WCC Hall of Honor,” pepperdinesports.com, March 8, 2014. See also Pepperdine Baseball Records Book, 2015 (pepperdinesports.com). 10 “U.S. Stars Rip Japan Twice,” Desert Sun (Palm Springs, California), June 23, 1975: B4. 13 Jack Lang, “Three Kid Hurlers Surprised by Mets,” The Sporting News, April 21, 1979: 5. 14 Jack Lang, “Mets Get Two Vets to Replace Kid Hurlers,” The Sporting News, June 30, 1979: 27. 15 Letter from Mike Scott to Rory Costello, received December 12, 2015 (hereafter “Scott letter”). 16 Ron Fimrite, “No Wonder He’s Hot,” Sports Illustrated, January 12, 1987. 18 Jack Lang, “Mets Trying Hard to Unload [Pat] Zachry,” The Sporting News, January 3, 1983: 32. 20 Pat Jordan, “Mike Scott Got a Grip on the Split-Fingered Fastball and Threw His Career a Nice Curve.” People, July 6, 1987. 25 Joe Mooshil, “Scott ‘Roughed Up’ by Frey,” Associated Press, June 5, 1985. 26 Scott Ostler, “Great Scott, He Throws a ‘Splitter’,” Los Angeles Times, August 14, 1986. 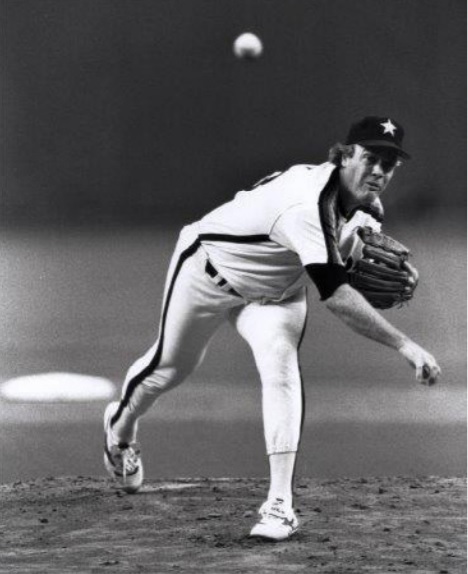 27 “Scott’s No-Hitter Clinches for Astros.” Associated Press, September 26, 1986. 28 Joseph Durso, “Scott Stymies Mets; Series Tied, 2-2,” New York Times, October 13, 1986. 29 The other League Championship Series MVPs from losing teams, as of 2015, were Fred Lynn (1982, California Angels) and Jeffrey Leonard (1987, San Francisco Giants). 31 “Mets accuse Houston’s Mike Scott of Scuffing Baseball” and “Feeney Clears Scott — for Now,” Associated Press, October 15, 1986. 32 Charley Feeney, “Umps: Scott Doesn’t Scuff,” Pittsburgh Post-Gazette, October 14, 1986: 32. 33 “Network Recalls 1986 Postseason,” Major League Baseball press release, November 4, 2011 (m.mlb.com/news/article/25882718/). Quote from an interview Scott gave for Major League Baseball’s documentary A Postseason to Remember: 1986. 34 Richard Sandomir, “Mets’ Announcers Slide Into New Roles,” New York Times, October 14, 2006. 35 Wire service reports, October 17, 1986. 37 Phillip Lee, “Classic Catches Up with Mike Scott,” ESPN Classic, November 19, 2003. 38 “Scott Accused of Scuffing Again,” United Press International, September 8, 1987. 40 Michael A. Lutz, “Mike Scott Misses No-Hitter by 1 Out,” Associated Press, June 13, 1988. 42 “Astros’ Scott Hesitant About Upcoming Year,” Associated Press, February 11, 1991. 43 “Astros Halt Comeback of Scott,” Victoria (Texas) Advocate, May 10, 1991: B1. 44 “Scott May Be Through with Injured Shoulder,” Associated Press, June 28, 1991. 45 Mike Forman, “Scott May Call It Quits,” Victoria Advocate, July 7, 1991: B1. 47 “Astros’ Mike Scott Will Retire,” Associated Press, November 21, 1991.